When one contemplates flying a business jet to Russia, regulatory limitations and ambiguities come to mind first. 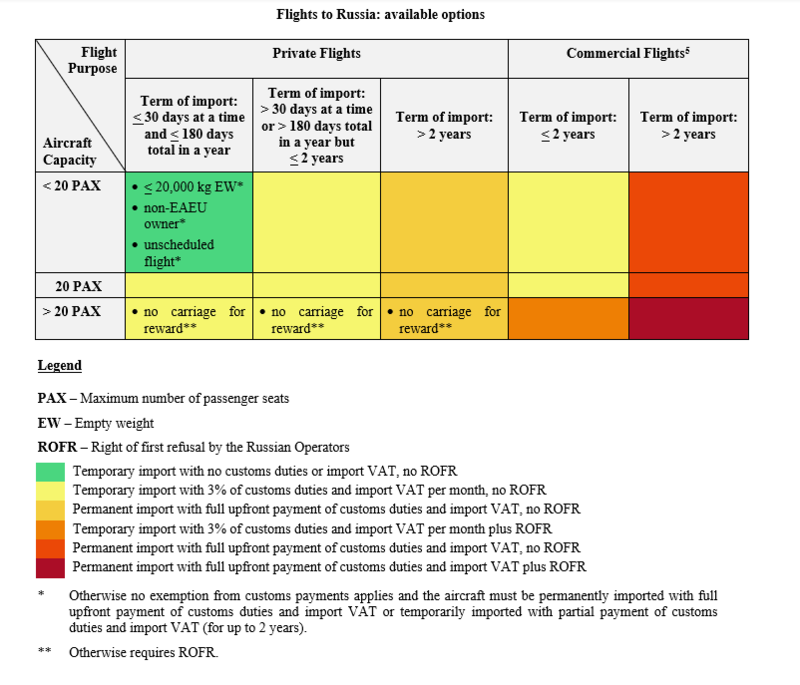 These concerns are not groundless because Russian aviation and customs regulations, particularly on the operation of business jets, are vague and convoluted. Compounding this regulatory quagmire is the similarly complex customs legislation of the Eurasian Economic Union (comprising Russia, Belarus, Armenia, Kyrgyzstan and Kazakhstan) (the “EAEU”). In this article we will endeavor to demystify the basic customs and aviation rules governing the operation of foreign business jets by foreign operators in Russia. As we seek to provide merely a concise overview here, this article will, inevitably, contain a degree of oversimplification and should not be taken as legal advice. If you find yourself in the fortunate position of owning or operating a business jet that has (i) a non-EAEU owner, (ii) 19 passenger seats or less and (iii) an empty weight of no more than 20 tonnes, you can use it for non-commercial and unscheduled flights under the temporary import regime without paying any customs duties or taxes. This way the aircraft may stay within Russia for no longer than 30 days at a time and 180 days cumulatively in each calendar year. This also makes obtaining flight permits simpler (of which see below). If the aircraft occasionally comes to Russia and no domestic flights are intended, it may be declared as an “international carriage vehicle” (instead of following full-scale customs import procedure) with no customs duties or taxes. This exemption is available for an aircraft that is registered in a non-EAEU member state in the name of a non-EAEU person. However, no such aircraft may undertake domestic flights or, whilst in the EAEU, may be transferred to a third party (other than for maintenance, storage or flying back out of the EAEU). temporarily for up to 2 years with a payment of 3% of the applicable import duty and VAT per month over the duration of the temporary import. The rule of thumb is that every foreign business jet operator must obtain a flight permit from the Russian aviation authority, Rosaviatsiya, for each flight conducted in Russia (whether international or domestic). Historically, the ability of foreign business jet operators to fly in Russia (for domestic flights in particular) was restricted and the regulatory regime was non-transparent and ambiguous. Improvements were implemented prior to the 2018 FIFA World Cup, but will remain in effect only through 1 June 2019. If (i) the requested flight is for the private use of a foreign operator or the owner of the aircraft (i.e. there is no carriage for reward such as a charter or carriage agreement) or (ii) the aircraft has a capacity of no more than 20 passengers, the flight permit application process is relatively simple. A flight permit can be expected to be issued within 14 business days in the event of item (i), and 1 business day in the event of item (ii). Otherwise, any application for a flight permit must be preceded by an offer to certain Russian airlines to conduct such carriage. The list of relevant airlines is available on the internet and presently includes: Aeroflot, Rossiya Airlines, S7 (Sibir and Globus), Ural Airlines, UTair and Pobeda (the “Russian Operators”). If no Russian Operator accepts within 5 business days, the foreign operator may proceed to obtain a flight permit to conduct the carriage by itself. To undertake domestic flights the aircraft must be imported (see above on available options). the aviation authorities of the country of registration of the foreign operator prohibit or restrict flights by Russian airlines or discriminate against Russian airlines. To sum up, it is easiest, from a compliance perspective, under customs and aviation regulations, if the carriage is a non-commercial flight and on a business jet with 19 seats or less and an empty weight of no more than 20 tonnes. Otherwise you may have to pay customs payments and/or undergo a longer flight permit application process. To illustrate the above, we have put together an indicative matrix showing the application of regulatory framework and variations based on the purpose of the flight, timing and the configuration of the aircraft. Domestic flight is where a passenger is taken on board and carried between two destinations within Russia. Treatment of flights between destinations within the EAEU is beyond this article. This customs procedure is designed for and normally used by conventional international airlines. The operational period of these regulatory improvements may be extended – a draft governmental decree abolishing that expiry date has been prepared but has yet to be adopted. Note that although commercial domestic flights by foreign operators are not expressly prohibited, a flight permit will be denied if information on the intended flight is published in the internet or on aviation automatic booking systems through which the tickets for flights by the respective foreign operator are sold. Debevoise & Plimpton LLP is a premier law firm with market-leading practices, a global perspective and strong New York roots. Approximately 700 lawyers work in nine offices across three continents, within integrated global practices, serving clients around the world. Its lawyers prioritize developing a deep understanding of the business of its clients.